Absolutely. We planted it. It was innitially damaged when one of the boys up to the cabin shot it with a pistol. We staked it up and tied it off and it strengthened and started growing like heck. 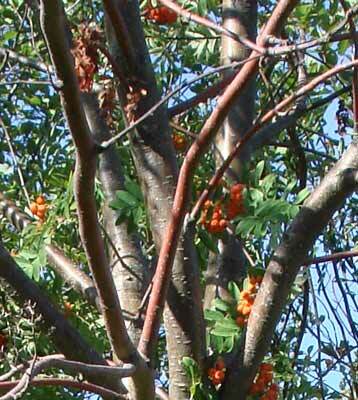 If you look at the one pic, you can make out the tell-tail orange clusters of fruit from the tree. Here is a zoom that shows the leaves and fruit. Your right Marcel though, the trucnk strongly resembles cherry. It would make a nice lamp .... Standing on its branches over in the corner of the cabin behind a rocker . Thats a nice tree , I am going to get me one and plant it on the farm . Do the birds like those fruits . That's neat, where's the nest Jeff? No clue, they were tailing off through the woods. 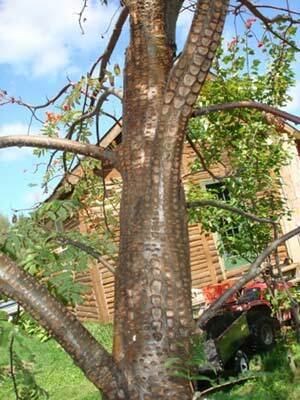 If I go back up with Pete and Lynda this week, and they are still working that tree, I'll see if I can follow them. Two of the photos sure look like sapsucker holes to me. Hornets are for sure grabbing something there though. Could it bee they are after the sap in the tree? 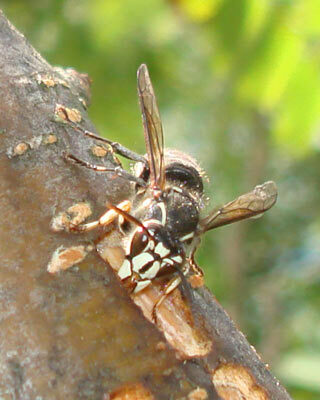 We were right in close enough to see the wasps clipping out the bark with their front mandibles. 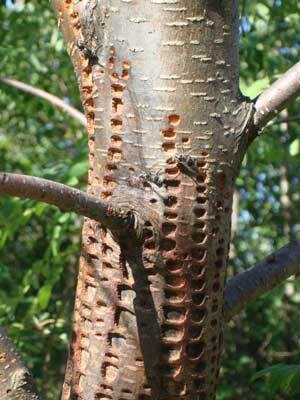 There were also other bees there getting sap, but the hornets were harvesting the bark. I couldnt capture it with the camera, although I tried and tried. I'm sure they were using the sap, but, I think they were also collecting fiber. These holes are square, not the round hole of a pecking bird. The hornets were industriously working in the new squares and the squares seemed to be getting bigger. I think that is the fiber that they are making their nest from. I got stung on the leg by one a few yrs ago when I was playin in the woods with my cousin, and it left a huge welt on my leg. 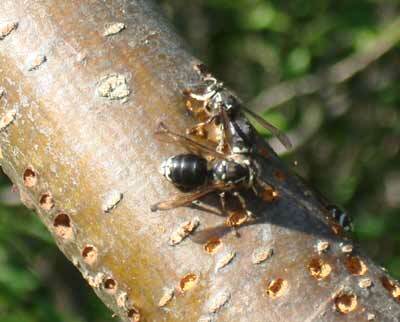 Lately been seein mud wasps here, building long tubes and stocking them with spiders to feed their larvae. It's pretty amazing how big some of the spiders are. My last house I put up a western red cedar fence around a firewood shed and compost bins, 1" X 6" in 6' lengths. 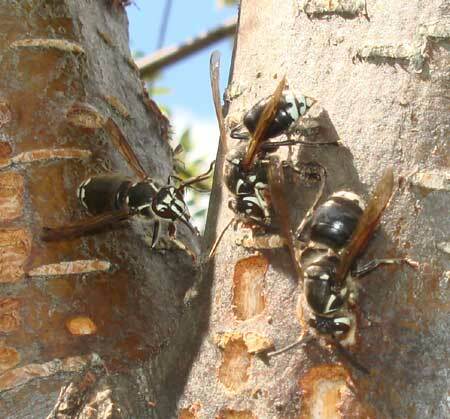 On the West and South side, (maybe because they were the warmest or most dry,) wasps of some sort came in and peeled off layer after layer of fiber for nests. The fencing was rough sawed and eventually looked planed. Probably took off a 1/4 inch over the course of 12 to 14 years. The place you'll find that nest will be along the edge of a thicket, where the sun can hit it part of the day. I was thinning a couple years ago and I almost stuck my face in one of their nests and with that Stihl in hand and harnessed to me, you outta have seen a fella swatting hornets and trying to get that quick release (yeah right) undone. I was lucky with the face shield they never got at my face and I don't think they even stung me, as I was swatting to beat the devil. But, they didn't want me any closer than 100 feet from that nest. I remember that a skunk or some other night prowler must have got them, because the nest was in shreds a couple days after and everything was calm again. 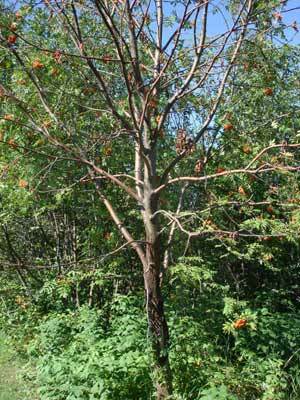 .....and choke cherry patches along line fences, where my mother always sent me into the abiss for cherries to be used in her jelly. I dunno beenthere, but I find them alot in fir thickets also. Can't really say they have an affinity to fir trees. I beleive it's more likely you run into them more often in those situations because you are covering almost every square inch of your ground weather it's pruning Christmas trees are spacing fir and spruce stands for future logs. Sometimes the blasted things will let me walk by them, and I won't notice them, when hanging ribbons and as soon as the brush saw operators come by, they attack. So I get blamed for not marking the nest, even though I never seen the nest nor got attacked. 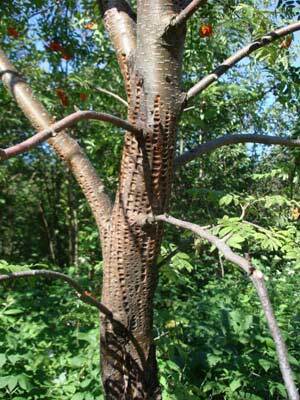 While at the cabin I took a few more photos of the Mountain ash and Hornets. They are relentless. I didnt take the time yet to try to find the Hornet nest but I know which direction it is, and its straight through the thickest bunch of tag alders on the place.